Sorry, i'm not really operative now because i'm busy with my work but fortunately sometimes i have the time for test maps and take a look at this thread. I agree with you, if this can help, i think that the beta and final release date should be shifted. My theory is work calmly and deliver a final product stable and beautiful, so don't look at the calendar, take your time! It's okay for me to shift release date, it's not like we having some sort of deadline. I've been busy lately, sorry for slow replies. Neon_Knight, in your PM to us, you told that "for the sake of releaseness, that would be the last deadline change.". About this, I want to add this. - At 0.8.8 release, Fromhell stated that there will not be other 0.8.x releases. But then the works for a 0.8.8-2 hotfix started, but that hotfix has not been released yet, after a year. So I don't know if that hotfix will be released; it may become a 0.8.9 maybe? - 0.9.0 is expected in case of Q3A texture compatibility version is completed. I have no idea about how this job is going, but I fear it's no progressing at all. - OA3 will require years of work. Hence, this mappack looks like will be the only "official" OpenArena upgrade in a quite long time. So, my idea is to take all the time needed to polish it. A short deadline isn't useful. You are right saying that we have to keep the mappack at reasonable size... so I'm not telling you to add 10 more maps to those already sheduled.... I'm telling you let's take the time needed to make those maps good (optionally adding one or two more if we wish). My new PC is in my house now, i have to copy all the Q3A and OA folder to the new system and try if it all work. 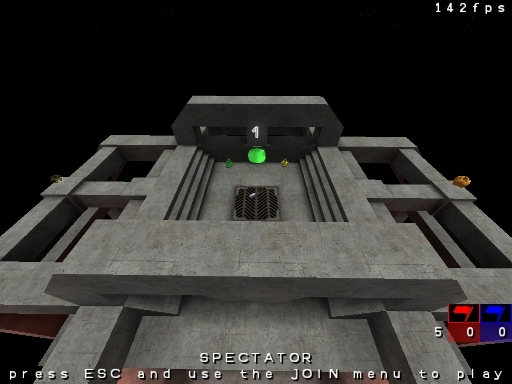 @Neon_Knight: Maybe this week-end i can give something to you all about my CTF map. Question: the CTF maps are thinked for all the others team gametype ? No problem to shift the release date of the beta2. If you want to add support for all the CTF-based gametypes to your CTF maps, then no problem. I started to work on it some months ago, I wanted to publish it during Halloween but I finally decided to shift its publication to the next year because I couldn't convince myself that it wasn't too bad. Then, I would like to work a bit on it to add it to the mappack. It's globally a ctf map, with 2 pirate ships as bases. Naturally, I don't think the "pirate" theme totally fits, as far as we play to Oa. So I wanted to know if I should work on it and change it, or if I should focus on the actual maps which are at their beta stage. -> I would delete the water, the batlle would happen in the space. -> I would modify the gravity. -> I would replace the sails by nothing (and add reactors on the back) or a balloon. -> I would delete all lights, and would just put flags on both ships to show team bases. ps: I'm not against the shifting idea. Theorically all gamestype are supported i think, maybe i have to insert some specific item or model ? It seems to me so dark than before or it's my eyes ?? Bots seems to play well, but they dont use the grappling hook, i suggest to remove it. 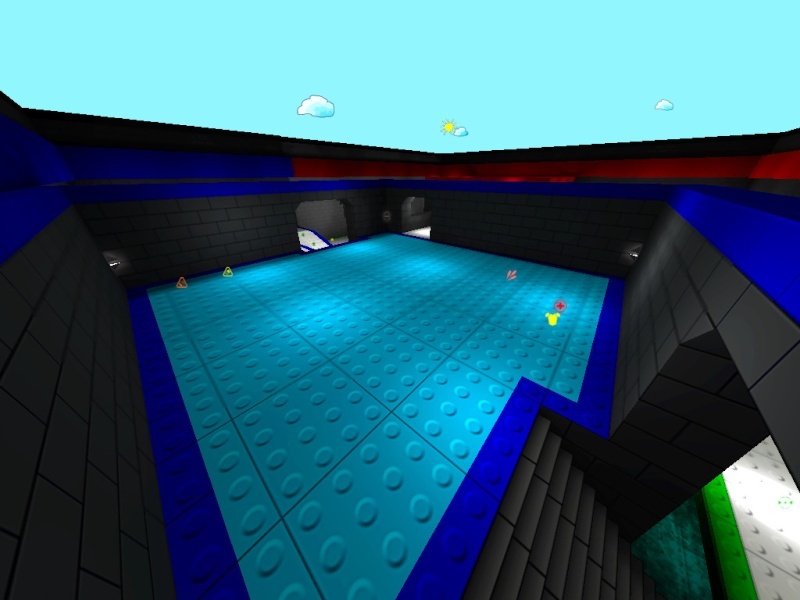 I've added the BFG in the middle floor just to imitate the original UT map. Tell me all it's wrong or what weapons/items you think it's better, remember however that is not a copy of the original map, it's my version. And I wouldn't leave out the grappling hook, it fits good in this map and is funny. Maybe just make it look like that a piece of a border is broken, so you can jump better on it. Another negative thing is that I spawn to 90% at side of the base and then the next bad thing is that there is no weapon to pick up till I am at enemy base. So speed-attacking with a picked up weapon in the hand is not possible. There should be some weapon outside for fast pick up. Maybe the Shotgun should be placed in front of the main entrance and instead of the Shotgun you could place a yellow armor. Hello ! 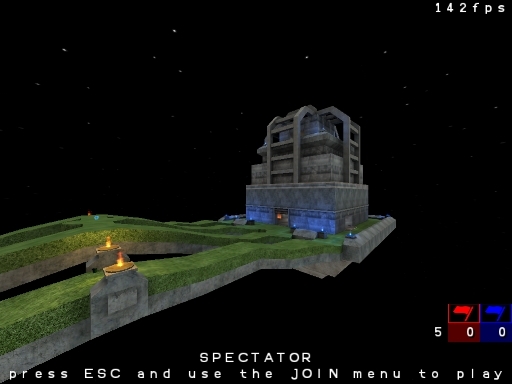 I loved this map ! I personally like the grapplin (and I don't give a f*ck of what bots can think about ! I'm crazy in my head !). Actually, I guess the bases are too easy to defend (if nobody uses the BFG..), there are 2 entries and from the main entry you can see all players who are going to attack from the back (the only way is to take a 90° turn just in front of the base's entry..). The grapplin can be pretty useful, as far sa you can climb on the roof and attack from the teleporters. Then, I don't remember that any Oa map uses a grapplin and your map appears to be really adapted to it, if you don't put one here I don't know where we should put one. Also, the new grapplin model rocks ! Otherwise, I have some aprehension on the BFG. I fear that it becomes a big f*ckin batlle between big f*ckin guns. Same thing about the rail, I never liked the rail and I fear that it becomes a camp batlle between campers. A last thing about items, in my opinion there aren't enought health and armor items. There is 1 MegaHealth but nothing more. some +25 Health and +50 armor wouldn't be too much (to me). Another thing, Thanks to the grapplin or the BFG, you can clim to the walls (I love it !) but there are only 2 weapons up there. You should had some items like Healths/armors or weapons like the plasma or the proxy mines (!). Especially on the 1rst and 2nd floor where we are almost hidden (I consider : floor 0: flag / 3rd floor: BFG / 4rth: railgun). Well, when we look from under, it looks flat, you should try to make something like a half Rhombicuboctahedron or a square cupola under the 2 bases. Then, the grass texture is quite disturbing, even if I have to say that it doesn't look bad. I personally love these lights. Sir ! Yes, Sir ! I'll start the new version tomorrow. 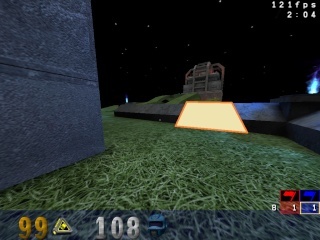 There are only two spawnpoints on each base, and they do not have any weapon around, as Adriano told. I would put two plasmaguns on each side of the base near front door, it's not too overpowered, since ypu also have BFG. The passages between bases are too narrow for my taste, I would make them 1.5x wider. The path around the base is boring, no items or weapons, I would put a jump pads at the sides, leading to the roof, or to the outer sidewalk with BFG. And I would put lightning gun somewhere near back entrance, so if you killed you can grab it and defend the base. The grappling hook is great, and it works fine on Android. I'm with Moixie's and pelya's oppinions. @ALL: the last version it's not the final version, i give it to you just to try, i've created the backdoor exit in the base, the central passage now is higher and you can see your opponent only when you are on the top, some minor changes. Of course i have to edit the map with ammo health and items, but i've asked you about it to be sure this is a good map to play CTF. 1 Shotgun with two ammobox in the base. 1 Rocketlauncher with txo ammobox in the base. 1 BFG with only 20 shots (no ammo). 2 Plasmagun with one ammobox in the base. 2 Railgun (one on the top and one on the left side at the first floor). 1 Megahealth in the center of the map. The map is nice... I think you can keep the hooks. 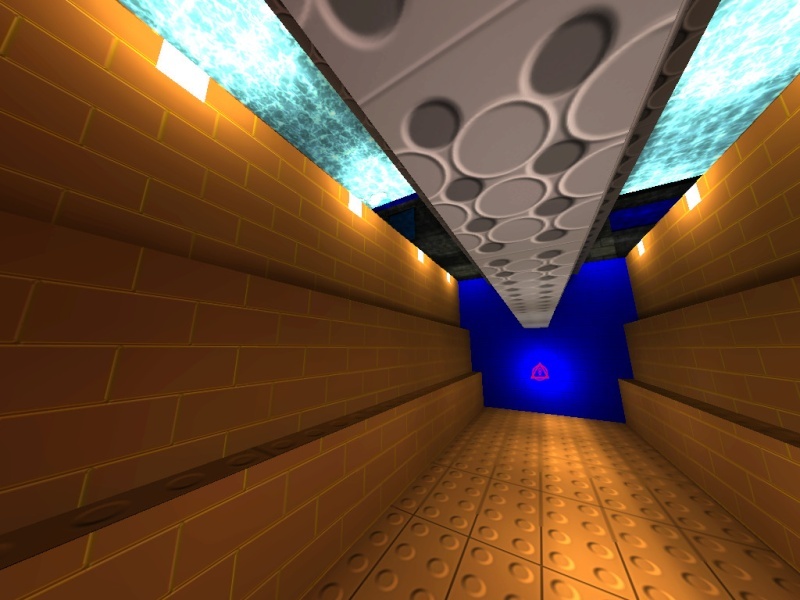 1) I'm still waiting for color-coded teleporters (depending from the floor they will bring you). 2) About the lack of weapons someone said, what about giving the shotgun to all players at respawn? It is an old habit with your maps, and I don't remember if you used that in any of this mappack maps (I think at least one or two of the maps in the package may have this feature). Of course, then you may replace the shotgun to pickup with something else. 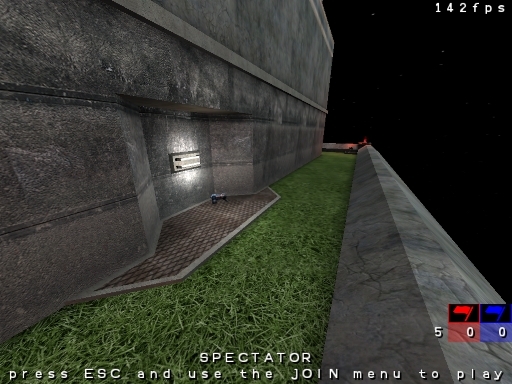 3) Again, I suggest to "fork" the grass path in a way that reaching the lateral parts of the building is more comfortable: short additional grass paths may bring to the point highlighted in the screenshot of Adriano (http://www.servimg.com/image_preview.php?i=274&u=12418615). 4) What's the strange thing in the sky, that you can see in the screenshot attached? 5) About the name oa_akomctf1... I just realized that some months ago you created a map called oaakomctf1 (without the underscore) as a tribute to the ArenaWarriors community... may that cause some confusion? I don't know. About the map I'm working on, I can tell you it's quite "open", so I had to somehow limit my fantasy and to do not exceed in details, to keep the framerate good, because vis portals cannot be of much help there (well, also in your map, r_showtris shows almost the complete map also from behind a building). When I willl post the first beta, I will need your help for suggestions to how to have it not simply looking like a giant box. Ehmmm.. my dear friend... how many times did I link this page to you? @Moixie: I'd like to try the pirate-themed map, before scrapping it. About the jolly roger there, did you remember to start from a GPL'd or PD'd one, or to draw it from scratch? @ALL: It seems there is a cvar called BOT_GRAPPLE, that is set to 0 by default. Do you wanna try it? I can't test it now, I have to go! Bye! I have moved the grappling Hook to the rear side of both maps, now are at the corner, you will see. Not for the moment, i'm working on the map and added some brushes to modify the map, i've also added some plasmagun near the spawnpoint of the players. It's a texture error, i have fixed it now. That map it's not an official one, no one care about it, and by the way there is no problem, tha different name dont create conflict. Cant wait to try it !! You can use a skybox that help the map to not seem only a box but cheat the player's eyes. Try the one i have used for oa_akomdm5, if you like it i mean. Thanks for the link to the wikia , not know why, but i can't find it anytime.... i'm blind ? @Moixie: I follow some of your suggestion. Try the new version in the attachment. @All: I hope this is the nearest version to the final one. I know there is a couple of bugs, but i want to let you try this version. Now it's more lighter than before, somethings are fixed. Now there are 4 way to run from one base to another. Fix the number because it's too distant from the wall, place some ammobox, build another sky with more tiny stars, place the target_location for location's names. 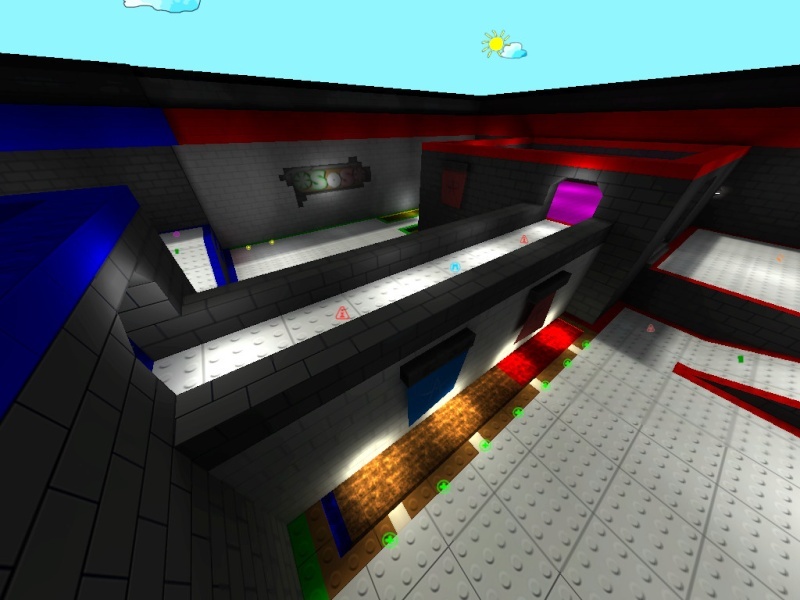 And finally make the map playable with others gametypes (i don't know how but i have to do it!). Have you noticed somthing else do i have to fix/make ? Well, in 1.5 days I couldn't start a whole new map, so I just thought: why don't combine two nice things from 2 different persons... and that's the result! => So I give you the option (mappack or separate map) to decide (for me it doesn't matter). What do you think is better? @Adriano: Good job , but work to make better brightness. For the textures (even the SOS logo), i think there is no problem if all are GPLv2. 1) Added the support for all team gametype, try it and tell me if you find some problems. 2) Replaced a couple of textures, now seems good. 3) Added some ammobox and some health/armor items. 4) Fixed a bug for the teleporter in one base and adjust the numbers. 5) Removed the megahealth and add two +50 health, one for side. 6) Builded an "arch" in front of each base to avoid to watch directly the opponent base. 7) Added the music in the level and placed some target_location entity. 8 ) Fixed the skybox textures. Now i think it's done, but wait for people response. P.S. : The attachment gives me an error (two times, dont know why) so i've upload the map on my Box.com personal host. I tried your map, It seems good but I played only against bots (and they don't snipe). 1) I've found confusing the numbers on teleporters. Maybe It would better like this: you enter teleporter 1 and you exit from teleporter 1, you enter 2 and you exit from 2. I will make all on the same level, or I will add some jumpads on the side of external roads, just to make your path less predictable. 3) Grass texture looks strange but seems nice. Buildings instead lack a bit of personality... perhaps marble textures for them? Don't know. 4) Haste powerup instead BFG? 1) I've fixed this issue in the last version that you can find in the message above your. Look at the box.com download link. The problem of the teleporters number was in the old version. 2) Take the roads on different level it's better i think, but i can link the roads in some point. BOT also jump from a road to another. 4) I was thinking that the Haste or a Regenaration item will be placed above the base entrance, up the new "arch" added in the last version. What do you think ? 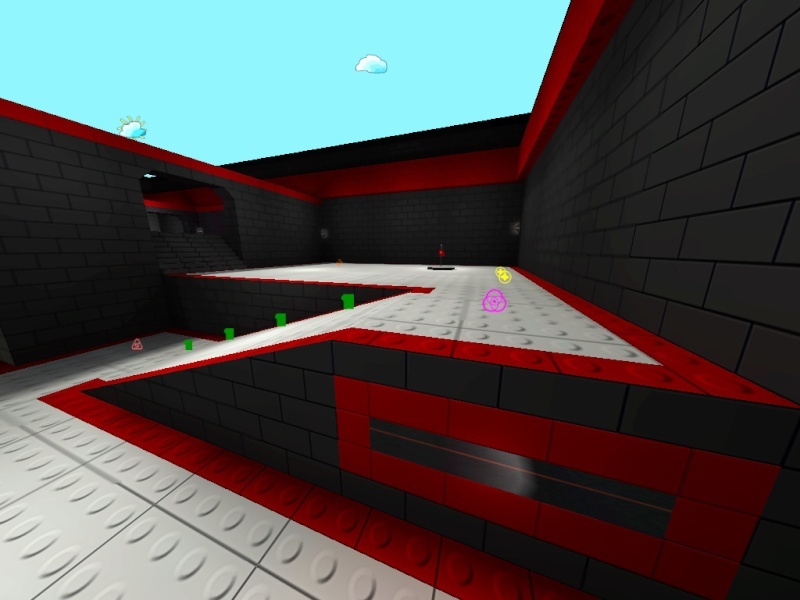 Have you (all) try the map in other gametypes ? It's all ok ? @Neon_Knight: Can you please, host this file in your host. Some users may have troubles with Java. I have to update everything, it's been a while since I've updated the wiki page. I've uploaded oa_akomctf1 and sos_ps37ctf. However, adriano: I'll wait for your map until son_goku2 makes it clear that his textures are GPL'd. If they aren't, I'm afraid I can't include it unless the map is retexturized. Sorry, the rules of the mappack. I don't know, maybe you could move the flags, place them into "closed" rooms, and/or change the central bridge and/or the water passage to make them perpendicular or diagonal, if compared to their current orientation. @Neon_Knight... what about giving up to the 22nd (friday) or 23rd (saturday) for the maps, and release the second beta on monday? - Congrats for the lower part, it looks better now. - But I would make the BFG respawn time higer (30 seconds? 45 second? 60 seconds? ): at the moment, it looks there are too many around. By the way, BFG is very useful in Overload mode! - Maybe the old places of the grapples were better: you had to do at least half map "normally" before being able to get one... now it's too easy. - For the floor numbers, they are ok. However, if you prefer, you could use roman numbers instead (I, II). - Bots seem to do not care a lot about the back door... did you try placing some item_botroam around there? - Someone said that bots do not snipe. I don't know if you placed info_camp entities or not... by the way, while playing, I got railed various times by a level 4 Sarge while I was using the hook. I don't know if he was camping or not. However, spectating, it seems they do not camp a lot. - It seems to me that bots do not care about the grapple even if I set bot_grapple 1... how's that in your tests, guys? I have worked a lot a this map, and i'm happy you (all) enjoy it ! By the way, i will modify the BFG respawn time to 40 seconds, but the grappling hook i dont know where place it, maybe i can remove one and place the other in another place..... maybe good in front of the initial "arch" ? For BOT sniping, i think that depends from BOT's "intelligence", maybe one BOT dont care about the Railgun, another BOT run to the Railgun and camp/snipe. BOTs dont use the grappling hook, i think it's because the original engine program dont contemplate this function. In the map I created, I placed some info_camp entities. I can see than by now and then, bots will annoy roaming and will stop at the info_camp point, looking around over and over for a quite long time, waiting for spotting some opponent. Of course, bot personality gives them a more or less "campy" attitude.